Beann (approximate pronunciation: byown, rhyming with down) is most often climbed in combination with Mullaghanattin as part of a circuit of the Pocket. Despite being unnamed on the Discovery map, it is nearly as high as its neighbour and has several satellites of its own. The ridge extending to the south-west towards Finnararagh is among the most wild and solitary routes in Ireland. Beann is the 76th highest place in Ireland. Picture from simon3 : Beanns viewed from the South. Picture: Beanns viewed from the South. 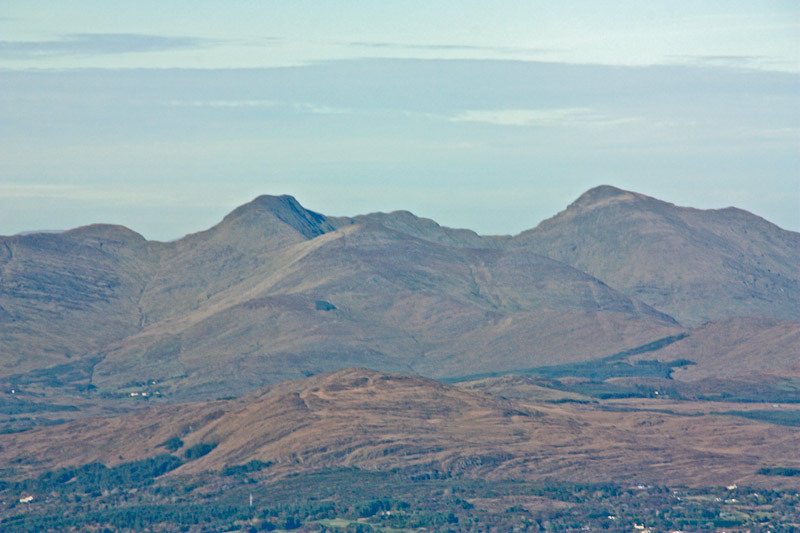 Beann is on the skyline, left of centre in this picture taken from Lackawee in the Caha Mountains. To its left are its SW Top, to its right its NE Top and then Mullaghanattin, looking from this angle more like a whaleback than the Matterhorn of Kerry.